I had no idea this book was based on a true story until I'd finished it. Apparently the author met Vinnie, the first character we meet in this story, and decided to write her story as a fiction novel. 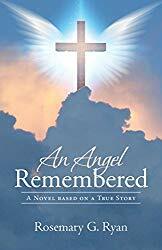 An Angel Remembered begins in the year 2000 as Vinnie mourns the death of her husband Leo, then moves to a look back at her life beginning in 1942 when she and Leo first meet. Once their daughter Lenora is born, the story follows her life through January of 1958, then returns to Vinnie in 2000 for the epilogue. Throughout the story, Lenora has a special relationship with the Lord and receives numerous visits from the angel Gabriel. Following this family through trials and joys and moves across the country was an enjoyable read. The tidbits of history scattered throughout were interesting, but the real beauty was the faith of a child and how she endured whatever came her way with peace. I read this book (which I received free from Booklook Bloggers in exchange for an honest review) on my Kindle. It was a fairly quick read, well-written and well-paced.